With the season eight premiere of Game of Thrones just days away, there's not much time left to theorize about how this epic story is going to end. Thankfully, there are still some cool theories on the internet that are just intriguing and unexpected enough that they could end up being true. Reddit user lobcity414 recently shared one such theory with fans. They suggest that Game of Thrones is, in part, a Biblical allegory and that the Night King might not be the ultimate evil we think that he is. Let's start at the top. Lobcity414 begins their theory by stating that each of the great houses of Westeros represents one of the seven deadly sins. Now, there's some debate about the houses mentioned in the theory and which sin they should represent, but the theorist breaks them down like this: House Tyrell represents greed, House Baratheon is rage, House Targaryen is envy, the Martells are gluttony, House Frey represents sloth, House Stark is the embodiment of pride, and finally, House Lannister is lust. Looking back on the series, an argument can be made for each of these correlations. For instance, pride could be seen as Ned, Robb, and Jon Snow's greatest downfalls. Remember, Ned dies because he refuses to lie about Joffrey, Tommen, and Myrcella's paternity, even if it means he could potentially survive for his own children. His desire to preserve his sense of honor at all costs leads to his house crumbling in his absence. Which house represents which sin is just part of the theory. The key to this theory is that each one of the great houses of Westeros is corrupt in some way. They're all an embodiment of sin, and the old gods may be on a mission to set things right. The theory suggests that the Night King and his army aren't inherently evil. Instead, they're weapons of destruction being wielded by the old gods, who aren't happy about the state of Westeros. It's been stated on more than one occasion that the old gods have been forgotten outside the North. Instead, people seem more inclined to worship the Seven or the Lord of Light. That makes it all the more interesting that the greatest threat to the Seven Kingdoms is coming from the deepest part of the North. In the Bible, God sends a great flood to wipe out all of mankind except for Noah, his family, and the animals they bring with them on their ark. The Night King and his army could be Westeros's version of the great flood - a cleansing designed to give the Seven Kingdoms a fresh start and turn the remaining people back to the old ways and the old gods. There's no doubt this is a cynical theory. At its heart, it suggests that the flawed nature of the core families is so great that they must be eradicated in order for Westeros to flourish. That bit feels flimsy since the show is all about embracing the fact that no one is completely evil or good. However, the idea that the Night King isn't just a bad guy, but rather an agent for something much larger than we could ever expect, is intriguing. 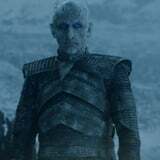 If the Night King portion of the theory proves to be true, then Game of Thrones could be heading for a far bleaker ending than we previously thought. After all, only one family survived the Biblical flood, and if the same thing happens in Westeros, then the fate of the Seven Kingdoms will be sealed.